I'm an iPhone User - That's Why "iPhone Tips"
My apologies to Samsung and other Android mobile device users. I’ve started to add links to the Google Play Store for all of the apps mentioned on the website. regardless of the type of mobile phone you use. What is an HEIC photo file? Starting with the iOS 11 iPhone mobile operating system, Apple started saving photos in the HEIC format. For videos, it’s HEVC = High Efficiency Video Coding. Without losing quality, these new formats save considerable storage space in your mobile devices. JPEG (aka .jpg) photo files simply “weigh” a lot more. At the time of this writing, we’re at an in-between stage: the HEIC format is not yet compatible everywhere. I’ve noticed however, that I can now email a photo from my iPhone photos app, and it will show up automatically as a .jpg file. That .jpg photo file format is then compatible nearly everywhere (including for folks with Android phones, for example). From what I’ve gathered looking into this, it seems apparent that more companies (maybe Google? Thus Android?) might also adopt this lightweight photo file format in the near future. Speaking of Google, currently the best solution to the problem of file compatibility between you, your iPhone and other devices or people with other devices—is to simply Google the specifics using key words to find out how to send someone a photo. Being very specific: “HEIC file to Windows 10” will help you get a more targeted answer. The rule of thirds is a guideline to help you take quality pictures that you can be proud of. 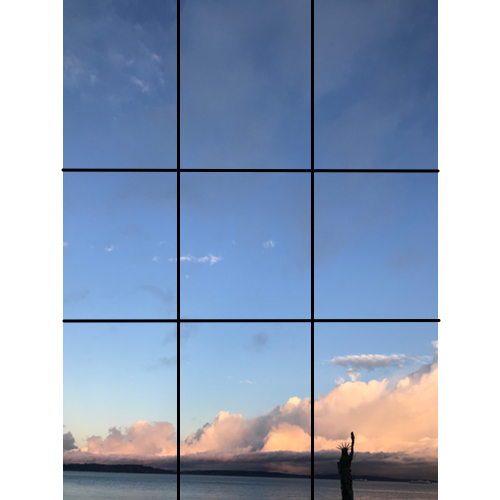 Luckily, the iPhone has a setting to help you to quickly compose a photograph using the rule of thirds. What exactly is the rule of thirds? That’s because the key elements of the photo — the clouds, the mini-Statue of Liberty, the horizon line along the water—do not lie on a grid line or at grid-line intersections. Basically, there’s too much sky and it overwhelms the more interesting elements in the photograph. Here is the same image, cropped (to get the rule of thirds). Most will agree that it’s a more dramatic photo. Notice the key elements of this cropped photo are placed on and within the grid lines. There’s a balance that is more pleasing to the eye. I should also note this: a large part of the more appealing nature of this shot is that the key features appear closer after the photo was cropped. However: hopefully, after seeing these examples, you’ll get a sense of what the rule of thirds means when taking a photograph. When turned on, it will show up in front of whatever you want to take a picture of. You can get great deals on refurbished iPhones and other technology here (inspected and tested, and with warranty). Turn on the Grid, by tapping the button. Then, open your camera on the iPhone, and you’ll see the grid in view. If you can add any other tips for taking great Camino photos, please leave a comment here! 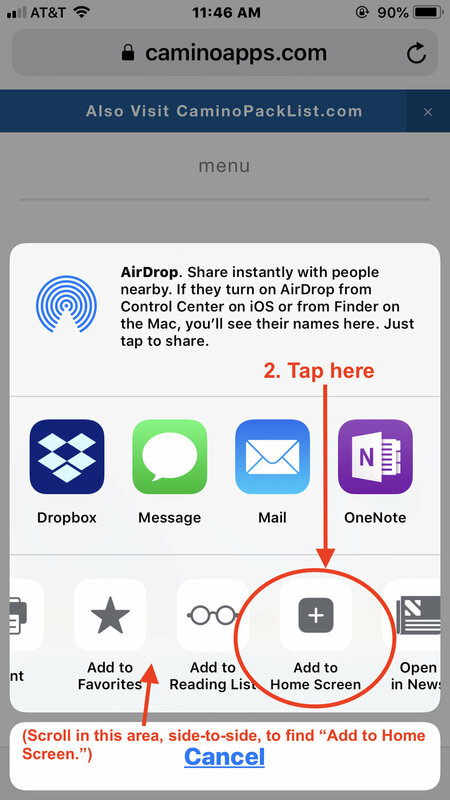 What is a Converter App, and how would I use it on the Camino? …and other categories that you may find useful when traveling—and perhaps at home or work too. The app is simple and easy to use. Nicely designed. One reviewer wrote that their older eyes loved this app... me too! I could actually see the results without my usual reading glasses! The app is free, but you can also subscribe from within the app for 99¢ USD per year (at the time of this writing) to get current updates for the latest money exchange rates. I subscribed because I wanted to show my appreciation to this app developer. A little more than a dollar per year (after taxes) seemed like a minimal way to do so. Apple’s iCloud is a great way to carry important travel documents, like PDF copies of reservations, spreadsheets of itinerary notes, and screenshots of useful information gathered from the internet. Many travelers also carry a photocopy of their passport too—just in case. It makes it faster and easier to replace it when you’re abroad. Even if you lose your mobile phone, you’ll still be able to access your documents from any computer or device (because they’re stored “in the cloud”). On your mobile phone look for an app called “Files.” That’s where you’ll find iCloud Drive (and your folders and documents). Here’s a screenshot of iCloud Drive, where folders and documents are stored…you’ll notice that Apple has preset some folders for you. To drag and drop folders or files into iCloud Drive from a Mac computer: open a Finder window, and look for iCloud Drive in the side menu bar. Here you’ll notice that circle is nearly filled in. This indicates the upload status of a file or folder. The circle vanishes once the upload is complete. The important thing to know is that you should not turn off your computer until the upload is complete. Your files and folders will then be available on all of your iCloud enabled devices. To quickly get to one of your favorite websites, make an “app” for your iPhone’s home screen. Finally, look for the “app” you just made on your iPhone’s home screen. I love this app, and use it all the time for calculations that require multiple steps. Sometimes it's difficult to find an outlet to charge your iPhone in pilgrims' accommodations on the Camino. And, there's the security issue if you leave it alone while charging it — imagine if an electrical outlet is not close at hand, so you can keep an eye on it (it's only in a bathroom, or a common-area kitchen, for example). So consider getting this portable charger for your mobile phone (it’s the best, in my opinion). Then you won't have to worry about trying to find an outlet in a safe location to charge your phone. Simply charge your mobile phone in your backpack while you walk, or by your side in a bar/cafe or in the common area of a pilgrim’s albergue. 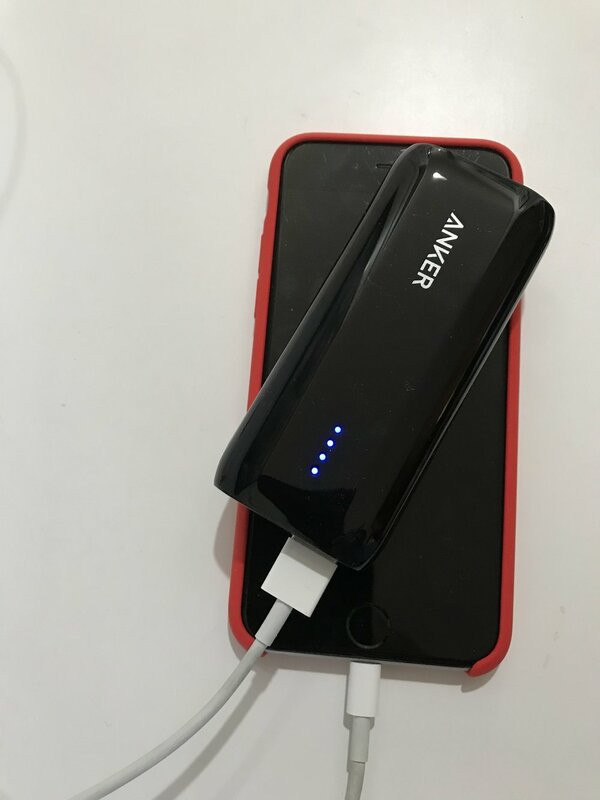 This is the latest power-updated Anker charger, and (as advertised) it is indeed the size of a "candy bar." It's lightweight too. Here are some photos of it, next to my iPhone 6s, so you can get a sense of the size. You can see that it is the size of a candy bar - mine weighed 4.3 oz or 122 grams. There’s another best selling charger (over 9k people love it!) although it’s slightly larger. Worth checking out though….CLICK HERE. But again, if you want the candy-bar size charger (I love it! ), CLICK HERE. I'm happy with the final product! 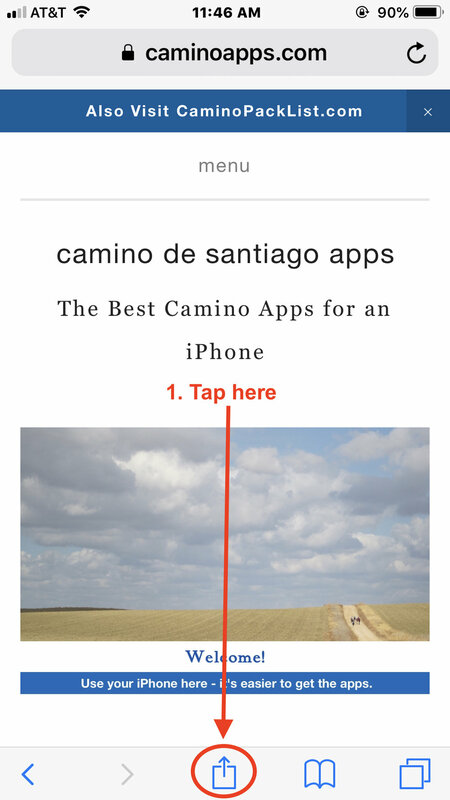 If you'd like to create small books, using your best Camino photos, get the app here. By the way, you could easily create a Chatbook while still on your Camino journey. 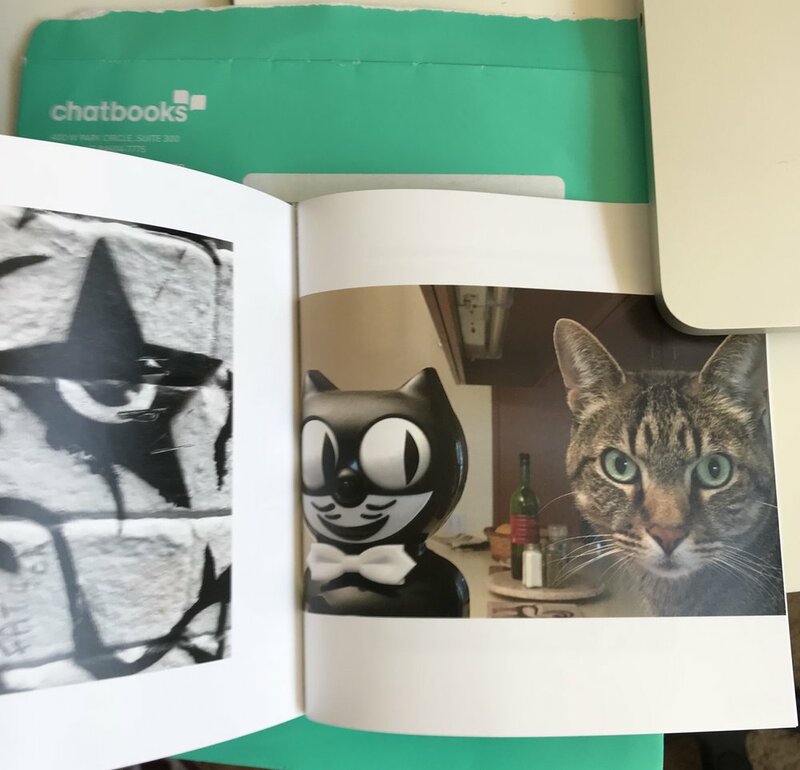 I used graffiti photos to test the quality of the color in my Chatbook, and to see how the detail looked. Again, I'm pleased. You can see the size of the Chapbook in relation to the pen. This book is 30 pages. Siri Can Translate Your Camino Questions. Problem: the Spanish translation is this — "Where is the lodging of the fleet?". Siri, it seems, is not yet familiar with peregrinos (pilgrims). So for the important things, double-check the translations. When you don't want to open your iPhone to find a translation app—Siri is fantastic for a quick translation. You don't even need to unlock your iPhone. just show your iPhone screen display to someone while your iPhone is still locked. for tips and recommended gear.